The story about the ‘Little Australia House’ is perhaps like the previous page, ‘Manchester Flower Show’, not of significant importance in the history of Rusholme (& Platt Fields in particular), but does merit inclusion in the pages of rusholmearchive.org. It was a notable part of the Park for some 40 years or more and has represented a particular facet of social history that is all too easily forgotten. It was in May 1959 that an Australian building company, GH Thomas, offered to build a wooden bungalow in one of the Manchester City Council Parks. At that time many British citizens were emigrating to parts of the Commonwealth, Canada, South Africa and especially Australia. Part of the attraction for Australia was no doubt the Australian Government sponsored ‘assisted passage scheme’. For only £10 each, a family could sail, (& later fly) to Australia where a new life was an inviting prospect. 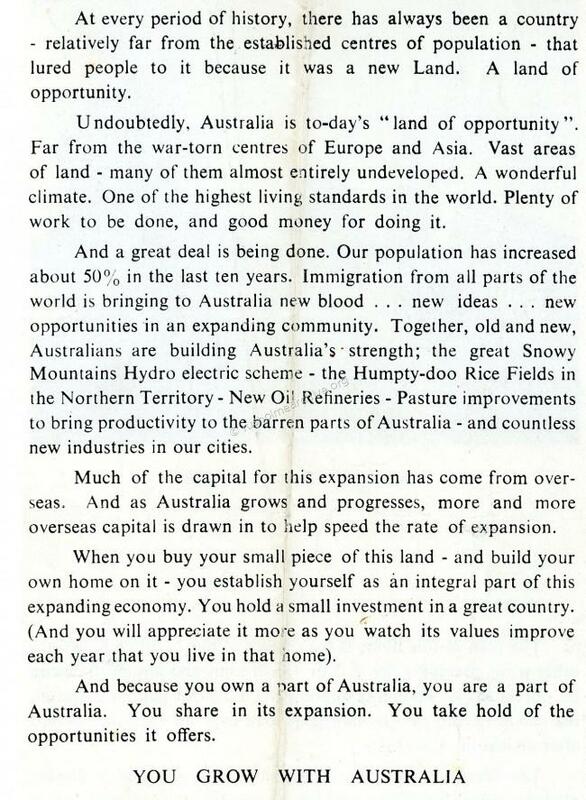 As the text in the leaflet points out there were many reasons why Australia was a popular choice for UK citizens who wanted to start a new future. 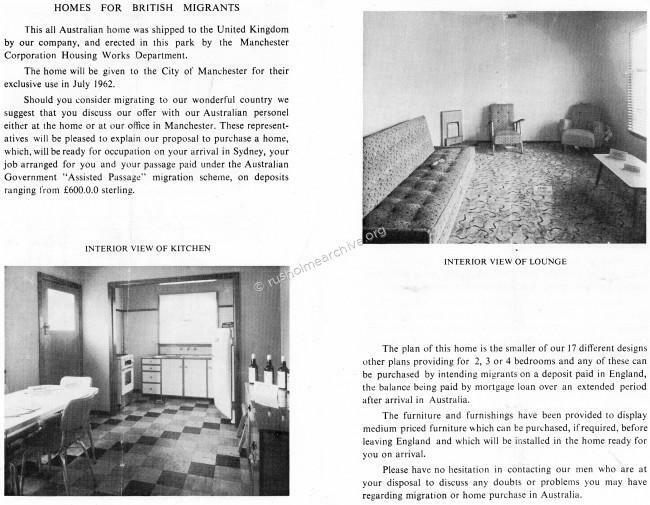 The offer to Manchester City Council was that in exchange for a plot in a Manchester Park, the newly built wooden bungalow would serve to show would-be emigrants the sort of home that they could expect to find if they moved to Australia. After three years of being exhibited the bungalow would then become the property of the Manchester Council. The offer was accepted and within two months the bungalow was built. It was opened in July 1959 by the Agent General of New South Wales, a Mr Buckley. The Australian bungalow was positioned by the side of the Park Café and in front of the lake in Platt Fields. The wooden house shipped from Australia by the building firm which gave the house, (or “cottage" as it was called by Australian speakers at the opening), hoped to encourage would-be immigrants to buy similar houses in Australia before they left Britain. Nineteen Sydney firms had given the contents of the house all of the furnishings, fittings, and a stock of Australian food. I am particularly grateful for the kind gift of this leaflet by a Rusholme resident, Mrs M Charlton, who also kindly donated the Trocadero cinema programme. 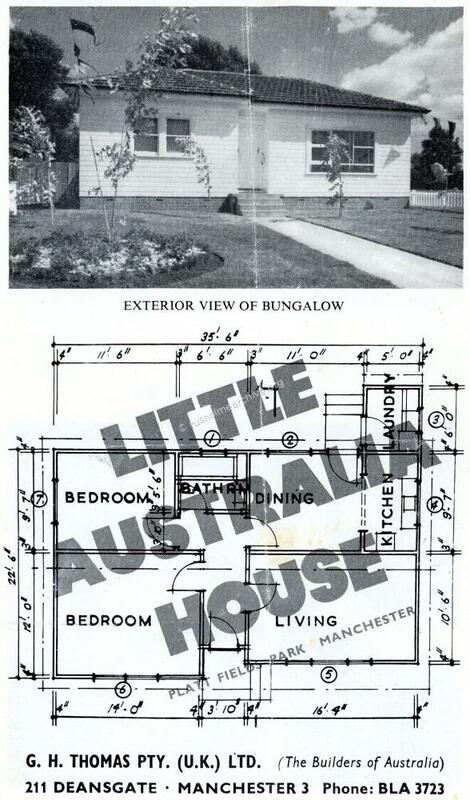 Beneath are the contents of the leaflet that clearly describe and show the ‘Little Australia House’. 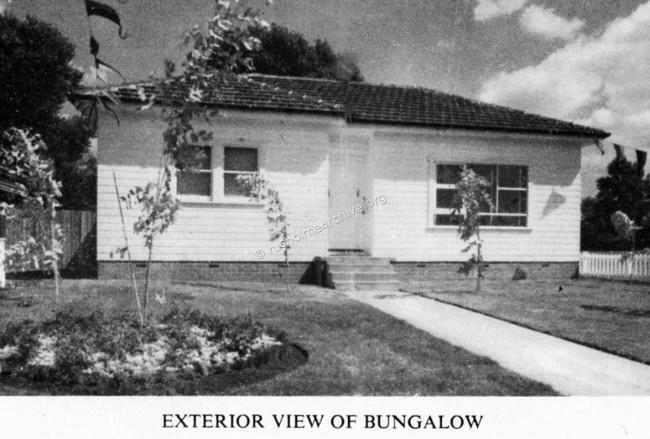 After three years the role of the bungalow as a ‘exhibition home’ was over and the City Council used it as a home where a Park employee and his family could live. It was for instance the home of the manager of the Lakeside Café. However it was in later years not always a popular residence. It was considered rather remote and at night it became target for hooligans who often attempted to frighten the residents. Eventually no Park staff or tenants could be found to occupy the property and after a period of being empty and a sustained attack by vandals the City Council demolished the bungalow and built the small children’s playground that is still there. Although there are many colleagues who clearly remember the bungalow, finding the exact date of demolition is proving elusive. Certainly it was in the late 1980’s, perhaps as late as 1993, there are different opinions generously offered and I can only hope that a reader of this page may have firm date that is authorative or I will have to spend some hours going through City Council Committee minutes to ascertain the exact date – please help me if you know and send the information to admin@rusholmearchive.org – thanks! Next page; Manchester Electrical Exhibition, 1908.